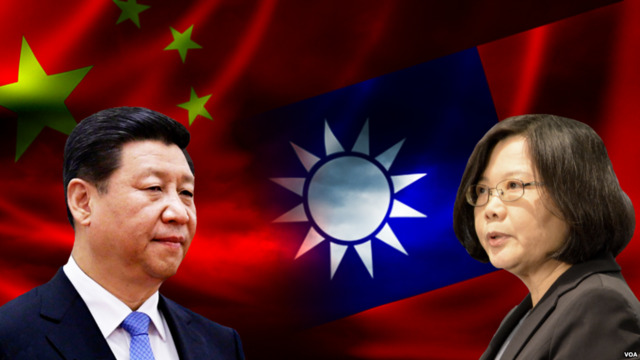 Since the election of Tsai Ing-wen as President of Taiwan, China has increased its intimidation and oppression towards Taiwan through a series of diplomatic, economic and military manoeuvres. This comes as a result of Tsai Ing-wen’s refusal to succumb to China’s rhetoric of Taiwan being a Chinese territory. Recently, China has begun to coerce the US government, threatening to hinder the US-Chinese relationship if Washington maintains a series of legislations strengthening US Taiwan relations. After a decade of relative quiet, tensions across the Taiwan Strait are poised to return to the fore as a major issue in the Asia-Pacific and a significant driver of tension between China and the United States. Beijing’s negative reaction to the election of Tsai Ing-wen as president of Taiwan has continued to fester, despite her efforts to engage the mainland on her own terms, and is beginning to escalate tensions in an area that has previously been relatively quiet. As a result, Taiwan has come under increased pressure from the mainland—pressure that has already had an impact in the United States. It is incumbent on the United States to therefore be cognizant of this pressure and account for it in its dealings with China and in its unofficial relationship with Taiwan. Xi Jinping, president of the People's Republic of China. and general secretary of the Chinese Communist Party, has already highlighted Taiwan as an important issue in his ambitious agenda. Speaking to 19th Chinese Communist Party Congress in Beijing, he called for “great rejuvenation of the Chinese nation” by mid-century, casting this as the realization of the Chinese dream of restoring China’s wealth, power, and territorial integrity. A critical element of this effort is to make the nation whole again, according to Beijing's conception of China's rightful national boundaries, which has direct implications for Taiwan. To put it succinctly, Xi has implicitly stated that China's full unification with Taiwan is essential to realizing its national rejuvenation. With the 100th anniversary of the founding of the Chinese Communist Party coming in 2021, Beijing is increasingly sensitive about any combination of factors it believes could lead to the “permanent separation” of Taiwan from the mainland. Also critical to understanding Xi Jinping’s approach to Taiwan, and especially how it impacts U.S.-China relations, is his expectation that China will receive greater degrees of influence and deference in the international arena. Xi Jinping seeks to gradually place China at the center of regional geopolitics, in Beijing’s interests and preferences are the key factors in any decision of geopolitical consequence in the Asia-Pacific. Further exacerbating Chinese sensitivities is the reality that the people in Taiwan are not gravitating closer into Beijing’s orbit. Recent polling suggests that roughly 75 percent in Taiwan see the two as separate countries, and only 14 percent believe Taiwan and China are part of one nation. In terms of identity, 57 percent see themselves as Taiwanese, 5 percent as Chinese, and 35 percent as both Taiwanese and Chinese. This is reflected in broader shifts in Taiwan’s politics, which witnessed the election of Tsai Ing-wen and continued disarray within the opposition KMT, which traditionally favors closer relations with the mainland. As a result of these frustrations, Beijing has begun to increase pressure on Taiwan. Beijing had already suspended official communications with Taipei in June 2016, and cross-Strait tourism has plummeted from more than 400,000 visitors in February 2016 to 250,000 in August 2017. Beijing has also further constrained Taiwan’s diplomatic space, switching official recognition by Panama and Sao Tome and Principe from Taipei to Beijing. China had already blocked Taipei from participating in a number of international events it had previously attended as an observer, including the 2016 International Civil Aviation Organization meeting, the 2017 World Health Assembly meeting, and the 2017 International Labor Conference. China’s military has also stepped up its operations in Taiwan’s vicinity. China sailed its aircraft carrier close to Taiwan multiple times—most recently in January 2018. Chinese military aircraft have also accelerated the pace of their operations near Taiwan, in an attempt to normalize its military presence. This has included a dramatic increase in Chinese air power, with bombers circling Taiwan several times per year, and in naval power, including dispatching China’s aircraft carrier through the Taiwan Strait and to the east of the island. Beijing’s pressure on the mainland has intensified in recent weeks with the opening of four new civil air corridors along China’s east coast without consulting Taipei. While this may seem relatively innocuous to an outside observer, its implications are significant. Taiwan's Civil Aeronautics Administration stated that establishing these routes without consultation is dangerous, and analysts describe the new air corridor as complicating Taiwan’s ability to defend its airspace by adding congestion and forcing Taiwan’s Air Force to rapidly exhaust its pilots and aircraft. Yet the significance of these air routes are more symbolic than technical: by operating close to the median line between the two sides, some in Taiwan feel that it “pushes Taiwan in a corner.” More significant, however, is Beijing ignoring Taipei in the basic administration of highly congested airways—this is a direct signal that Beijing sees Taipei as illegitimate and not worth engaging on even the most mundane of government functions. This pressure campaign seems to suggest the beginning of more explicit efforts by Beijing to influence American political decision-making and American politics more broadly, similar to what Australia has experienced. In its annual report to parliament, Australia’s domestic intelligence agency, the ASIO, wrote that efforts by foreign governments to influence Australian society represents “a threat to our sovereignty, the integrity of our national institutions, and the exercise of our citizens’ rights.” These concerns have spread to include Australia’s business community, its universities, and its Mandarin-language media. The United States should become more cognizant of the challenge posed by Chinese pressure on issues like Taiwan, and be prepared to push back. Indications (no matter how small) that the United States can be successfully pressured by Beijing on its relationship with Taiwan—such as USTR’s inexplicable decision to “de-flag” an entry about Taiwan on its website while allowing other nominal “non-states” such as Macao and Hong Kong to remained “flagged”—will only fuel additional efforts by Beijing to pressure the U.S. to diminish its relationship with Taiwan. This is yet another example of why the United States should engage Taiwan on its own terms, and not as a policy tool to manage its relationship with Beijing. Building on the long-standing policies established by the Taiwan Relations Act in 1979—robust trade and investment, regular arms sales, and unofficial contacts—remains the best way to address U.S. interests in the Taiwan Strait.